Venturing out into familiar cities or unexplored territory with the people closest to us renews and strengthens the bonds of friendship as well as provides us with a brief vacation from the stress that surrounds our lives at work and home. Admit it, sometimes we all need to take a weeklong getaway with our friends. It helps to anchor us, balance us, and realign us with who we really are. Sadly, planning a getaway for an entire week comes with its own set of stresses. Where should you go? How are you going to get there? Where should you stay? Do you need to purchase tickets for concerts, shows, etc.? All of these are questions that often derail our getaway before it even begins. However, it doesn’t have to be that way. We have done some of the research for you. So sit back, relax, and read our list of the best weeklong getaway destinations to explore with friends. Rolling hills, picturesque vineyards, beautiful beaches, and soaring mountains are just a few things to expect when planning a weeklong getaway to California. 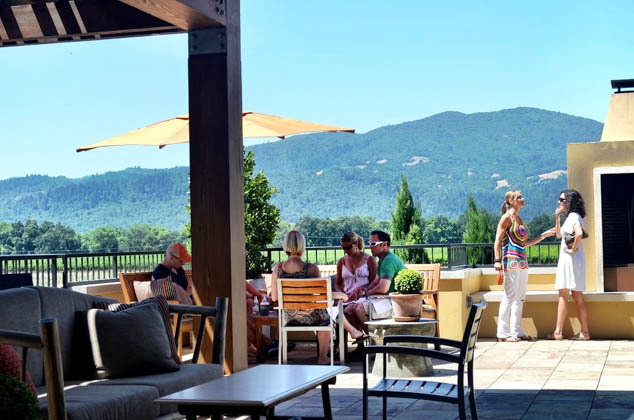 A couple of the most popular spots are Napa Valley and Sonoma County. It would be easy to spend your days traveling between wineries and overindulging on tastings and excellent food. However, this area of Northern California is in a prime location for some adventurous day trips. A few of my personal favorites are venturing to San Francisco, driving the PCH, visiting Old Sacramento, and hiking among the redwoods. Another option is to go on a more extended road trip and head to Big Sur for a couple of days. The atmosphere, wine, and day trips make wine country in California one of the best places to take a weeklong holiday with friends. It guarantees laughter, long talks, and adventure. This famous city's claim to fame is its thriving music scene. Yes, Nashville has plenty of live music and renowned music landmarks that you will want to visit. The bustling energy of the city, booming nightlife, and popular food scene will impress everyone in your group. Of course, you want to make sure to spend a couple of days in Music City discovering the history, sipping micro-beers, listening to an astonishing live musician, and getting out on the dance floor to learn a new line dance. However, it has much more to it than just music. To truly make this an unforgettable journey, take a few more days to discover the area. There are countless choices for day trips to places like Stone Rivers National Battlefield or Cumberland Caverns. Overall, Nashville is a good option to think about when planning a journey with a group of friends. No place in America enjoys life in quite the same way as New Orleans does. The Big Easy is legendary for its southern Cajun cuisine, jazz music, and nightlife. Without question, one of the best ways to experience the city is with a group of your closest friends. The French Quarter is just as you would picture it with its small boutiques lining the streets and the iconic iron barred balconies wrapping around entire buildings. This destination is perfect for those looking to indulge. Whether it is food, drink, nightlife, shopping, or music, New Orleans takes it to a new and surprising level, making it one of the best destinations to experience with a group of friends. Let us take a step back from the music, wine, and parties and talk about the perfect place for a weeklong getaway in nature. While there are thousands of sites across America for outdoor adventures, Beaver Creek combines luxury with landscape. Enjoying a spot high in the Rocky Mountains, it offers fantastic hiking trails, bike paths, ski slopes and more. There are several gorgeous resorts that are modeled to be a scenic mountain village filled with restaurants, shops, and entertainment. Plus many offer rooms with fantastic views, fireplaces, and hot tubs making it a cozy countryside getaway. Tucson is an excellent choice for those who want an active getaway. The temperatures in Tucson have a winter low in the high 50's and a summer high in the upper 80's. Since the air is dry, the climate is mild all year round, making it a perfect getaway in every season. The city is known for the Arizona-Sonora Desert Museum, quaint little shops, and Spanish style missions. However, the area offers so much more. Tucson is on the doorstep of Saguaro National Park, which lures visitors from all over the world to see the beautiful cactus deserts full of native plants and wildlife. Whether you are looking to do a scenic hike or a stunning desert drive, Tucson is a fantastic home base for those seeking to explore the desert landscape and get active. From the jazz music of New Orleans to the mountains of Colorado, this list covers some of the best trips to take with your friends. Whether you are planning a guy’s, gals’, of mixed company getaway, this list has something for everyone as they offer a range of different activities to fill your week with excitement and adventure as you explore the amazing corners of America.